There are many services required by our cars and trucks that help them perform as designed for years and years. While much of this maintenance seems routine, such as oil changes and filter replacements, there are some services that often get forgotten about until it's blatantly obvious the car needs it. This is often the case with wheel alignments. 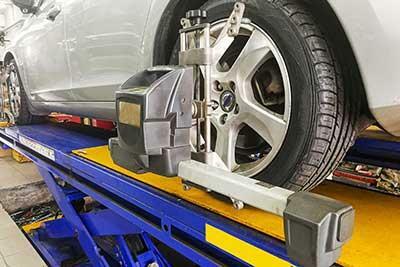 A wheel alignment is done to help ensure that the vehicle continues to drive straight down the road with little effort. A car's alignment can be thrown off if the vehicle has a run in with a curb or pothole, is involved in a larger accident, or simply because of the wear and tear caused by the daily commute after many, many miles. It's a good idea to have alignments conducted every 10,000 to 15,000 miles, as good alignment results in a easier to drive, better performing car. However, you may need an alignment sooner, especially if you encounter any of the following signs of alignment trouble. One of the most common signs that a vehicle requires a wheel alignment is if the car drifts or pulls to one side or the other. If you seem to be fighting the steering wheel to keep the car running straight down the road there is a good chance an alignment will straighten out the issue, quite literally. Another often reported symptom of poor alignment is a steering wheel that seems to vibrate, shake or rock back and forth. This happens due to the vehicle trying to go in two different directions at once, which is the basic problem at hand when the vehicle's alignment is thrown off. If one tire is out of sync with the others, that tire will try and pull the vehicle is a separate direction, resulting in the steering wheel vibrations. If you suspect that your car has an alignment issues go ahead and check the tire tread. A car that has been suffering from a problem for even a short amount of time may begin to show tread wear symptoms of a poor alignment. You'll basically want to look at the tread on opposite side of the car, such as front two or back two, and see if you can notice different wear patterns. If they are visible, then it is time for an alignment and possibly new tires. Poor wheel alignment can make driving your car a real chore. If you suspect it is time for a wheel alignment in Katy head to Auto Check. Our ASE certified auto repair technicians will straighten everything out for you! Give us a call at (281) 815-2351 to request more information or to schedule expert auto repair in Katy, TX, today.